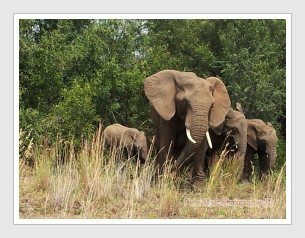 (12 hrs) We collect you and drive to Pilanesberg National Park, the famous Big Five Nature Reserve near Sun City, for your game viewing and photographic safari. 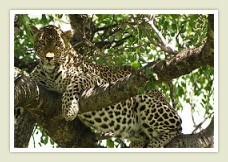 It is a Guided game drive, in search of the wild animals, including the "Big 5", which are: Lion, Leopard, Rhinoceros, Buffalo, and Elephant. 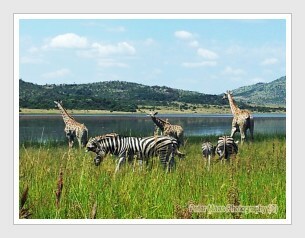 Many game species are hosted in the Pilanesberg National Park of 55000 ha, in an extinct volcano area of 1200 million years ago, with some rock formations of 2400 million years old.. If you are interested to see Sun City, we make a short visit there (Sun City features a casino, adventure sports, water sports and swimming pools at the Lost City complex). Price Per Person : Price on request. 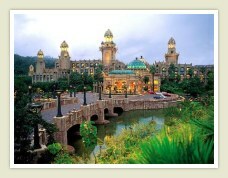 Lunch time is provided inside Pilanesberg, or at Sun City at your own leasure. Please feel free to contact us if you are interested in this package, or if you would like us to tailor make a tour package for you. Join us on a safari in search of the Big Five in Pilanesberg Game Reserve, and visit the beautiful Sun City Entertainment mecca.